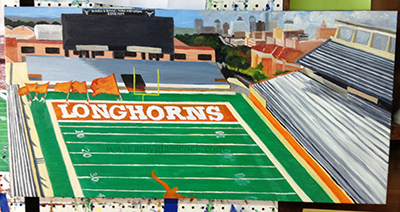 Next I am going to paint something to do with University of Texas football. Stay tuned for updates! 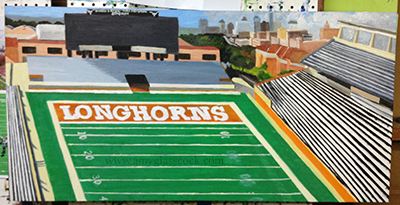 My Texas Longhorn Football painting begins! 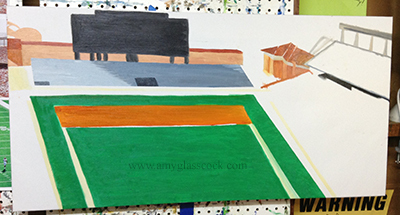 More work blocking in the shapes today. I began painting the seats... many more details to come. I worked on the horizon and the stands again. 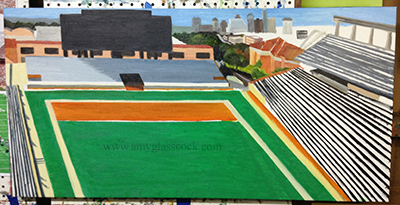 I added more buildings in the background and also some details on the left side as well. 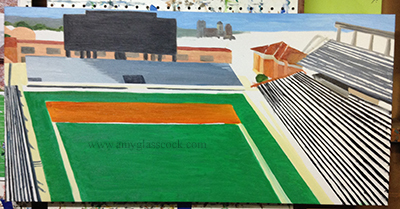 I added a bunch of trees in the background and changed up the right line on the field. 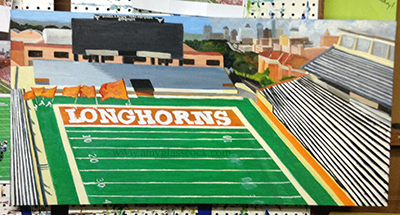 A little bit of work on the scoreboard. 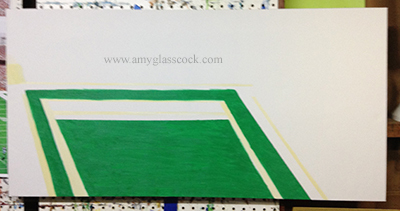 Some work on the white lines on the field. I added the letters in the in-zone. 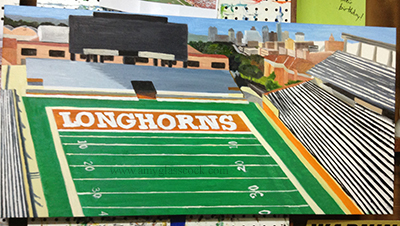 I still need to touch them up a bit more when they dry. 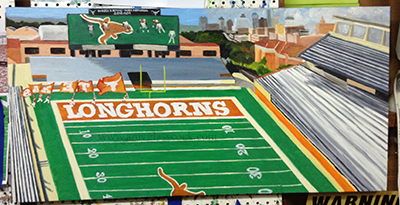 I changed the upper deck and started to add clouds in the background. 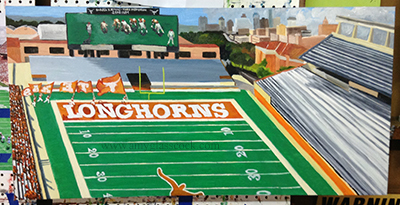 I started adding the cheerleaders running with the Texas flags today. 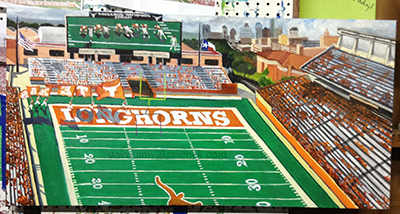 I added the Longhorn in the middle of the field and also started working on the stands on the right side again. 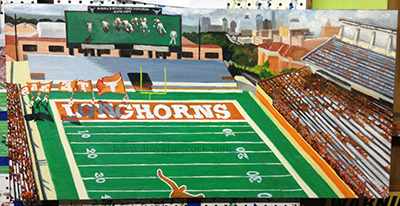 I worked on the yard line numbers again and added white around the longhorn in the middle of the field. 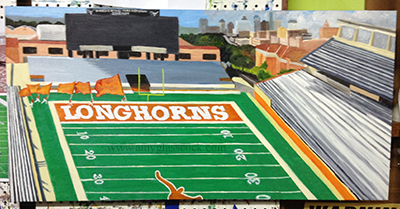 I worked on the flags and the scoreboard today. 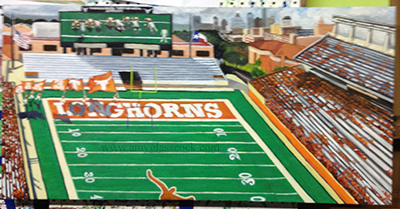 I added some football players on the scoreboard and added a few details to the cheerleaders. I decided to take out the longhorn logo on the scoreboard because I think it will look better with the contrast of the green grass with the players and thier shadows. 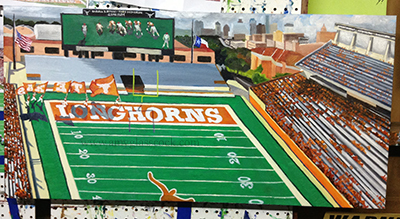 I also started adding the crowd on the left side and the shadows of the flags and cheerleaders. 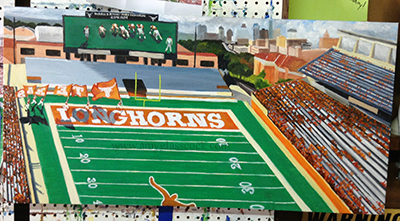 I added the shadows and started adding the crowd on the right side. I also added more clouds. 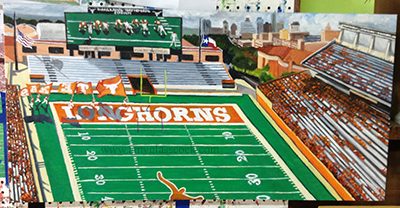 I worked on the lights on the top of the stadium and added the shadow on the right crowd. 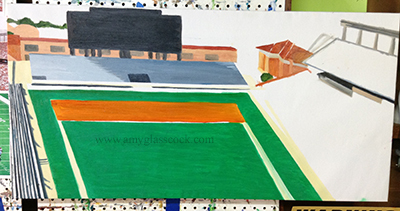 I worked more on the shadows on the shadows on the field. 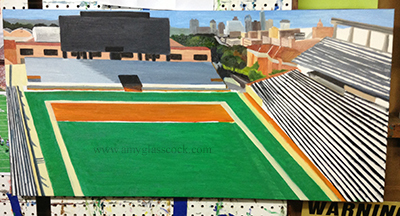 I also added some dark blue lines on the field. 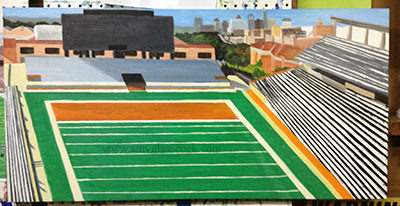 I worked on details in the skyline today and a little bit on the upper deck. I added lines to the scoreboard screen. 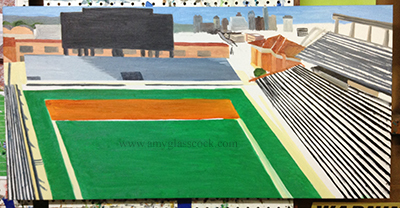 I added more lines to the field. 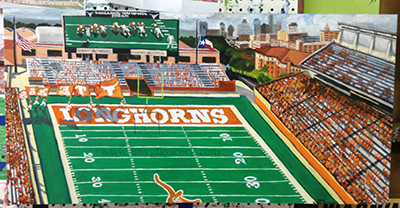 I added some fans in the endzone. 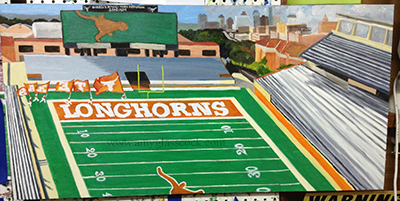 I worked on the right side stands and the endzone stands again. 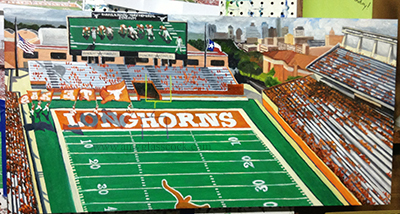 I worked on the crowd on the right and on some of the flag shadows.